We’ve done it: these 155 pages (or 174 in another size) are not just “riveting reading”, but also a major accusation of a number of very unconscious men. For it’s only their unconsciousness that prevents them from acting in accordance with their conscience. Anybody interested in this aspect my enjoy watching Dear Woman – an eight-minute apology by conscious men on behalf of their gender. Paulette’s experiences are such that one marvels, once again, at the human ability to endure violence, cruelty, inhumanity and injustice that one should have to call madness, unless one goes mad oneself. Paulette has not gone mad at all. She has endured one problem after another and has written them up with a lot of creative energy. 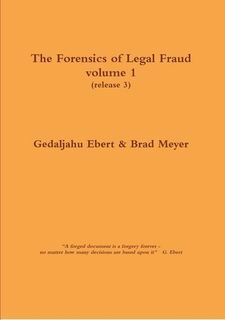 Volume 1 of The Forensics of Legal Fraud has been downloaded over 2000 times which is a lot for a legal book. As Volume 2, this account of another serious victim of a fraudulent bankruptcy and other white collar crimes, I trust that the right people will find this link. And I hope that its reading will spur you into action. For, ultimately, it’s a battle between Good and Evil – with your own conscience as your judge, and The Rule of Law as the public dividing line.